The rippled server uses a transaction queue to help enforce the open ledger cost. The open ledger cost sets a target number of transactions in a given ledger, and escalates the required transaction cost very quickly when the open ledger surpasses this size. Rather than discarding transactions that cannot pay the escalated transaction cost, rippled tries to put them in a transaction queue, which it uses to build the next ledger. The transaction queue plays an important role in selecting the transactions that are included or excluded from a given ledger version in the consensus process. The following steps describe how the transaction queue relates to the consensus process. Consensus Round 1 - Each validator proposes a set of transactions to be included in the next ledger version. Each also keeps a queue of candidate transactions not currently proposed. Consensus Round 2 - If a validator removes a transaction from its proposal in later rounds, it adds that transaction to its queue. Consensus Round N - The consensus process continues until enough servers agree on a transaction set. Validation - Servers confirm that they built the same resulting ledger and declare it validated. 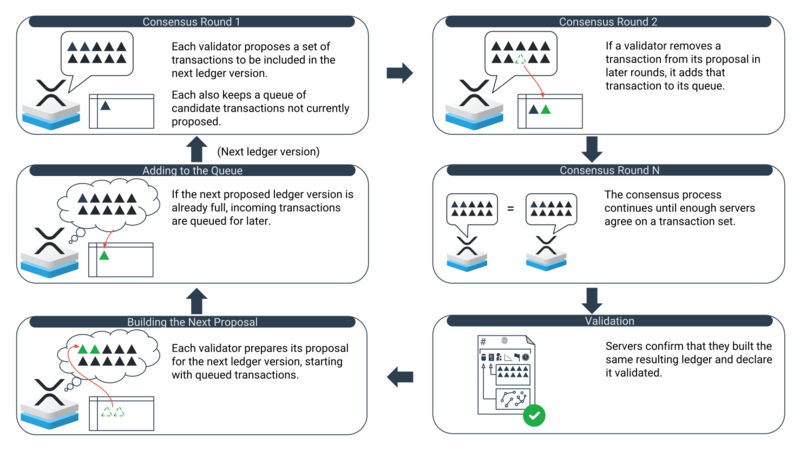 Building the Next Proposal - Each validator prepares its proposal for the next ledger version, starting with queued transactions. After this step, the process repeats from the beginning. Note: Technically, several of the steps described in the above process occur in parallel, because each server is always listening for new transactions, and starts preparing its next ledger proposal while the consensus process for the previous ledger version is ongoing. Transactions must be properly-formed and authorized with valid signatures. Transactions with an AccountTxnID field cannot be queued. A single sending address can have at most 10 transactions queued at the same time. Sending the maximum sum of XRP that all the sender's queued transactions could send. Keeping enough XRP to meet the account's reserve requirements. If a transaction affects how the sending address authorizes transactions, no other transactions from the same address can be queued behind it. If a transaction includes a LastLedgerSequence field, the value of that field must be at least the current ledger index + 2. If a sending address has one or more transactions queued, that sender can "push" the existing queued transactions into the open ledger by submitting a new transaction with a high enough transaction cost to pay for all of them. Specifically, the new transaction must pay a high enough transaction cost to cover the open ledger cost of itself and each other transaction from the same sender before it in the queue. (Keep in mind that the open ledger cost increases exponentially each time a transaction pays it.) The transactions must still follow the other queuing restrictions and the sending address must have enough XRP to pay the transaction costs of all the queued transactions. Cancel the queued transactions by submitting a new transaction with the same sequence number and a higher transaction cost. If none of the above occur, transactions can stay in the queue for a theoretically unlimited amount of time, while other senders can "cut in line" by submitting transactions with higher transaction costs. Since signed transactions are immutable, you cannot increase the transaction cost of the queued transactions to increase their priority. If you do not want to invalidate the previously submitted transactions, fee averaging provides a workaround. If you increase the transaction cost of your new transaction to compensate, you can ensure the queued transactions are included in an open ledger right away. Within the transaction queue, transactions are ranked so that transactions paying a higher transaction cost come first. This ranking is not by the transactions' absolute XRP cost, but by costs relative to the minimum cost for that type of transaction. Transactions that pay the same transaction cost are ranked in the order the server received them. Other factors may also affect the order of transactions in the queue; for example, transactions from the same sender are sorted by their Sequence numbers so that they are submitted in order. The precise order of transactions in the queue decides which transactions get added to the next in-progress ledger version in cases where there are more transactions in the queue than the expected size of the next ledger version. The order of the transactions does not affect the order the transactions are executed within a validated ledger. In each validated ledger version, the transaction set for that version executes in canonical order. Note: When rippled queues a transaction, the provisional transaction response code is terQUEUED. This means that the transaction is likely to succeed in a future ledger version. As with all provisional response codes, the outcome of the transaction is not final until the transaction is either included in a validated ledger, or rendered permanently invalid. Transaction Cost for information on why the transaction cost exists and how the XRP Ledger enforces it. Consensus for a detailed description of how the consensus process approves transactions.